Bob’s wife, Linda, has hacked the Network Marketing mystery and earned millions of dollars while living with time freedom. 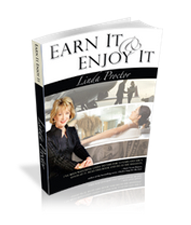 Download her book, Earn It and Enjoy it to see how you can do the same and learn more about Network Marketing opportunities. I’ve written (and said) many times that everything I know about Network Marketing I learned from somebody else. I love learning and I love learners– those thinking men and women whose lives are devoted to knowledge. And I’ve never met a learner who didn’t give more than he got. Such is the case with Bob Proctor—he is a master student, and more, a master of a teacher. I take notes when Bob speaks (and I usually never do that), because there are always three or five insightful, thought-provoking, immediately useful things he says that I don’t ever want to forget. Robert, you have an extensive background in corporate America, in teaching and training those people. What attracted you into Network Marketing? A doctor I have tremendous respect for got involved with a Network Marketing company. It was seeing his picture in a Network Marketing magazine that brought the industry to my attention and caused me to take a look at it from a totally different perspective. What was the basis of your respect for him? I’ve studied the mind for approximately 40 years, and he probably taught me more about the mind than any other individual. He knows more about the mind than anyone I’ve ever met, or even read about. He’s not a money guy, he’s involved in the healing arts, so when I saw his picture attached with this company, I thought “There has to be something here that I don’t understand.” So I decided to look into it. When I did, my whole perspective of the industry changed. I think I’m like an awful lot of people in that I didn’t understand it but thought I did. If someone had asked me to explain Network Marketing, I would have been at a loss to explain it. And yet, if you had said, “Do you understand it?” I would have said, “Sure” when the truth is, I didn’t. Did you have a negative impression of it, Bob? I don’t think I had a negative or positive impression. It was more disinterest than anything. I often say “I was caught in my own trap.” I have taught in numerous programs that anything we don’t understand we have a tendency to criticize and ridicule carelessly. What did you find when you started looking? I found that, all things being equal—good company, good product—it’s probably the most moral form of compensation I have ever seen. And I’ve studied a lot of them. I believe that the whole universe operates in an orderly manner, and Network Marketing operates more in harmony with the laws of the universe than any other business I’ve seen. A person truly receives exactly what he’s worth. No nepotism, no favoritism. I find that rather unusual in the business world. What are some of the laws you’re referring to, and how does Network Marketing honor them? Well, for example, the law of cause and effect—which is one of the laws in the universe—clearly states that energy returns to its source of origination. Or in more familiar terms, what you sow, you reap. Action and reaction are equal and opposite. This business is so perfectly aligned with that principle. If a person puts the effort out, it does come back. People are recognized for their efforts—recognition is a big part of it, and compensation is a big part of it. I see that there are two sources of income in life, one psychic, one material. The psychic income is the satisfaction we get from how we spend our days. We should earn enough money to provide the things we want and live the way we choose. Network Marketing, for the most part, offers that person the opportunity for both. The people I’ve observed who are successful in this industry truly love what they are doing. Once they understand the system, away they go—helping others understand it, too. Keep in mind that there are a lot of people who are not successful, but that’s their own fault. Another unusual characteristic of Network Marketing is the seemingly small distance from the bottom to the top. Can you say more about that, because a common criticism of this industry, Bob, is that there are just a few people at the top while most people are struggling? That is something that people say, and yet, if you ask them to explain it, they’re unable to. Again, what we don’t understand we have a tendency to criticize and ridicule. I was probably guilty of that. I got up and said that I didn’t know anyone who was earning any money. Well, I really didn’t know that many people involved in Network Marketing at all. There were passing acquaintances, but I certainly didn’t know what they were earning. I’ve since found out, of course, that there are a lot of people earning great money in Network Marketing. My wife has been very successful, and she’s having an awful lot of fun at it. I spend almost all of my time working in this industry now because I enjoy working with Network Marketers so much. I still do some work outside, and it’s not that I couldn’t do more; I just don’t really have a desire to. Bob, besides the moral quality that you’ve already spoken about in the structure of Network Marketing, what other differences do you see between Network Marketing and a conventional business? The difference is like night and day. It’s paradoxical, really—people who do not understand Network Marketing point at it as a pyramid, when the truth is that they are probably involved in something that truly is a pyramid! All business is shaped like a pyramid, but the difference is that in Network Marketing, everybody is at the top of their own pyramid. In corporate America, that’s not the way it is. A good example of a pyramid is a Canadian bank. There are only half a dozen banks in Canada, and the people at the top all earn in the millions, while the teller probably earns $20-25,000 a year, with very little hope of getting to $35,000. A person can sit down and draw her own star, then go and get it in Network Marketing. On top of that, she’ll get help—in Network Marketing, everyone wants to help everyone. That isn’t the case outside this business. In Network Marketing, a person has the opportunity for expansion and fuller expression. In other words, his life can continually improve. There seems to be no end to it. I’ve only been around the industry for a little over three years, but I’m absolutely fascinated with it. People naturally want to expand and express and grow—the corporate structure impedes that growth, while Network Marketing supports it. In fact, it’s to the advantage of the people above you to help you grow. Bob, in looking at the uniqueness of this business, what are some of those challenges that Network Marketers face? I think the biggest challenge a Network Marketer faces is the paradigm shift that they have to make themselves. Second is learning how to present the opportunity to someone in such a way that enables that person to make a paradigm shift, too. We’re conditioned genetically; we’re conditioned environmentally. Like the old economy—if you look at it as the old economy and the new economy. The old economy deals with competition. I think a good example is if you had a pie, and the pie is cut up, and you get a piece, I get a piece, maybe six other people get a piece. If I want more of that pie, I’ve got to outwit, out-market, or out-sell you, or out-scheme you. For me to have more pie, you’re going to have to have less. We’re dealing with a limited supply. In Network Marketing, which I believe is the distribution system that is ushering in the new economy, a person is dealing with an infinite supply, which is in line with spiritual laws. There is no limit. So the person says, “If I want more pie, I’ll make a bigger pie, and I’ll make you aware of how I am enjoying more pie, so you can, too.” It is the most phenomenal system, and it just keeps getting better, because you become more and more aware of the truth of it. What kind of difficulties does that present for somebody who, say, came out of a corporate environment where the rules of the game are different? I’ll give you a good example for your readers to try. Question to the readers: are you right-handed, or left-handed? Okay, now I’m going to ask you to sign your name. Sign your name on a piece of paper. Now put the pen in your other hand. Don’t just read this—put your pen in your other hand. You can feel the tension building in your body. Your mind reacts to it. You think “I don’t write with my left hand. This is so uncomfortable. It’s so cumbersome. I’m going to make such a mess. I’m going to make myself look foolish, and what will my neighbor say?” We’re not programmed to write with our other hand. People are programmed to live a certain way. What we’re saying is change the programming. It’s like learning a new language. It’s almost as if you go home and your family doesn’t speak English any longer, but French or Spanish. Eventually, you would learn what they are saying, but it would be extremely difficult and very stressful at the beginning. Can you speak about the things that need to be reprogrammed, specifically, Bob, or give us some examples of things? We have to begin by understanding ourselves, and improving our self-esteem. We’ve been raised to be dependent on the corporation, the boss, the company. We’re programmed to believe that if you go to school, get a good education and a job in a big company, that you’re safe. Of course everyone knows that that’s not true. People have been being laid off, downsized, reengineered, or fired by the hundreds of thousands—many are walking the street wondering what’s happened. We’re living in a new economy. The world has shifted—I believe it’s aligning itself more with the universal laws. See, there’s a bigger gap today between the haves and the have-nots than there ever has been before, and it’s getting wider. In a recent article in the Toronto Daily Star, they pointed out that the top ten percent of income earners are earning 314 times what the bottom ten percent are earning. The people on the bottom haven’t even a hope of how to get to the top, and the old system isn’t going to help them. Network Marketing clearly explains how you get to the top. The intellect can understand that—”I know I can get to the top. Now I’ve got to change that emotional, conditioned mind of mine.” That’s harder, but people care and want to help you make the transition. There are some absolutely brilliant people who intellectually understand it, and yet don’t make it. They don’t make it because they never get that paradigm changed. I think there has to be more education in that area. Network Marketing is still new enough that it has not come together for the development of people yet—and it may not for a few more years. It’s in an evolutionary state. There has to be more focus on helping the individual change her subjective conditioning. People have a difficult time grasping it, so they struggle. You see, wealthy people have always had multiple sources of income. I believe that wealth is a very real part of life—it has to be addressed and understood. A person cannot live a full life if he doesn’t have any money, because we use money for things, and we need things for the development of our potential. I have been teaching people that they must have multiple sources of income if they are going to accumulate any wealth—not just one source. It won’t work. The beautiful part about Network Marketing is you set up multiple sources of income with each person you bring in. So in a relatively short period of time, I could have two or three thousand sources of income. It makes a difference in a person’s life. Which speaks to the business of leverage? Absolutely. There are three income earning strategies: M1, M2, and M3. M1 is trading our time for money. Approximately 95 to 96 percent of the population does that. It has an inherent problem called saturation. What do you mean the inherent problem is “saturation”? You run out of time. You only have so much time, and if you’re trading your time for money, you obviously have a ceiling on what you can earn. Doctors are realizing that today. The doctor has to spend more time to earn less money. So does a laborer. So does a lawyer—chargeable hours are the most important words in a lawyer’s vocabulary. That’s the M1 strategy that school teaches us and that we’ve observed our parents’ involvement with, for the most part. If a person becomes wealthy on the M1 strategy, it’s at the expense of a life. They’ve compromised on the car they drive, the home that they live in, the vacations they take, the school they give their kids, the clothes they wear, because they need the money to live. M2 is an excellent strategy—investing money to earn money. Those who understand it know that leverage is a great way to work the M2 strategy. There’re only three people out of 100, though, who understand, and some of those aren’t very good at it. Now, M3 is, without question, the strategy that wealthy people have always used. It’s a strategy of leverage. Approximately one percent of the population uses this strategy, but they earn around 96 percent of all the money that is earned. M3 is multiplying your time through the efforts of others, by setting up multiple sources of income. It’s a phenomenal strategy, and Network Marketing is tuned into it. Earning money has absolutely nothing to do with work. This is the real paradox. Say more about that, please. Now, let’s take what he’s saying and relate it to Network Marketing—”Riches come, if they come at all, in response to definite demands based upon the application of definite principles, and not by chance or luck.” Is there a demand for someone who can show that 96 percent, the people who are feverishly involved in a losing proposition in the M1 income earning strategy, how to move to M3? Is there a demand for someone to show an individual how to close the gap between the haves and the have-nots? I think there’s a screaming demand for it, and it’s something that Network Marketing does. We show them how to close the gap. We show them how to spend their days doing the things that they really love doing, and at the same time, earn the amount of money they need to live the way they choose to live. I don’t think we’re made for work, I believe that work is made for us. I work every day, but I never look at it as work, because I absolutely love what I’m doing. I find it amusing that I get paid so well at times. I would do it for nothing, because I absolutely love it. Love is harmony—it’s when your conscious mind, your sub-conscious, and your body are all in sync, and you truly love what you’re doing. Are you willing to talk to me about the role of love in Network Marketing? Sure—that’s a subject that people should spend a little more time with. I see love as resonance. It’s harmony. People who are in love with helping people are huge winners. You see that proven in Network Marketing all the time—the big winners in Network Marketing love watching a person wake up. They love watching them win. I watched a couple being recognized recently—they stood before the audience and said that they had been married for 13 years, and got a divorce. They stayed in touch because of the kids. One of them got involved in a Network Marketing company and got the other one involved, too. It ended up bringing them back together—after three and a half years apart. They’re happily married again now. Those people love what they’re doing, they love each other, and they love helping other people. And who do you think likely received the greatest reward, the most satisfaction? The person who sponsored them. That’s the biggest reward for people—helping others win.